Online registration for this event is now closed. We only have a few spaces left. If you wish to attend this event, please contact the SAA office via email. Please note that we will not be accepting drop in's for this off site event. Thank you for your cooperation and understanding. The Asian Art Museum’s spring exhibition Kimono Refashioned features a cornucopia of Japanese textile traditions that were enthusiastically adapted into the modern and contemporary fashion worlds. In this lecture, local scholar Yoshiko Iwamoto Wada will lead us into a deeper understanding of the wonders of such textiles with a focus on tradition, design innovation and re-use of material. 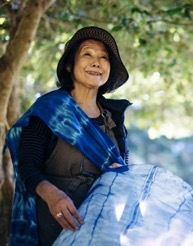 Yoshiko Iwamoto Wada is an artist, curator, author and co-author of several books including The Kimono Inspiration: Art and Art to Wear in America, Memory on Cloth: Shibori Now, and Shibori: The Inventive Art of Japanese Shaped-Resist Dyeing. She was named Distinguished Craft Educator - Master of Medium by the James Renwick Alliance, Smithsonian Institute, 2011 and in 2016, was awarded the George Hewitt Meyers Award for her lifetime achievements and exceptional contributions to the field of textile arts from the George Washington University Museum Textile Museum. She is an Honorary Fellow of the American Crafts Council.